Ballpark Estimate: $350 to $1,500. If you’d like to incorporate a chuppah (sometimes spelled chuppa or huppah) into your own wedding, you might be interested to know that you can find them in all shapes, sizes, and price points. Almost anything goes today for modern wedding chuppahs, so it’s perfectly appropriate to exercise your preferences in selecting something that appeals to your senses and taste. You can even design and build your own personalized wedding chuppah if you feel like getting creative. The use of a wedding chuppah in Jewish weddings can be traced back to the Middle Ages, when this tent-like structure was used in outdoor ceremonies as a haven where the bride and groom could exchange their vows. This practice continues today, with the canopy, or chuppah, continuing to serve an important role as the bride and groom’s special place. Wedding chuppahs can be appropriate for use both indoors and out. Regardless of the setting, within the chuppah’s covering, some of the most meaningful Jewish wedding traditions are performed, such as the blessing or Kiddush over the wine, exchanging of the rings and the breaking of the glass. While getting married under the chuppah is an important tradition commonly used for Jewish weddings, this decoration is certainly not limited to this religion. Today, using a wedding chuppah is also popular among people of all faiths. The most common wedding chuppahs consist of a frame supported by four poles that are typically held up by attendants (or can alternately be propped in stands or weighted down in some way). However, some couples prefer freestanding wedding chuppah versions that have more sophisticated design elements and a more formal and sturdy frame. Some chuppahs incorporate beautiful piece of fabric strewn over the frame to serve as the covering or “roof,” or use a prayer shawl or tallis as their wedding chuppah covering. This can be a meaningful touch and can be something the wedding couple can save as a memento of their Jewish wedding ceremony for years to come. Other couples prefer to invest in a special chuppah covering that contains religious artwork or abstract designs that appeal to their taste. In addition, it’s possible to have the chuppah covering custom-made, with the couple’s names, wedding date and any other special details incorporated right in. This can be done with hand-painting, embroidery or other handiwork. You can also opt for a chuppah that’s made entirely of wood or iron slats that are decorated with special items such as flowers, ribbons, tulle, lace, tiny lights and other accents. Just keep in mind that regardless of style and formality of the wedding chuppah you desire, the most important thing is that it be open on all four sides in order to symbolize that guests will always be welcome into your home and into your lives. To get an idea of the type of chuppah you’d like, you can do a search online to see the range of options that exist. There is a great deal of room to incorporate your creativity and personal style in this wedding item, so don’t be afraid to search for something that feels just right for your wedding design. You can also ask your rabbi or florist to show you photos of other couples’ wedding chuppahs to see what appeals to you. Where to purchase a wedding chuppah depends on the type you want and whether you prefer to rent or to buy. For a Jewish wedding, you might shop for a chuppah from your temple gift shop, look at Jewish bookstores and contact other places that rent or sell religious Jewish items. You can also do a keyword search for chuppahs online. A few sites you can try for purchasing chuppahs includes Chuppah.com, Myownchuppah.com, and Bens Tallit Shop. Some temples or synagogues have their own chuppah that they can provide for couples who are getting married on site. Or, you can ask your florist about renting a chuppah, since most of them can provide one that they can decorate with flowers and other special items to match your wedding bouquets and other decorations. In addition, you can check with party supplies stores to find out about renting a chuppah frame. If you decide you want to create your own chuppah, you can do a search online for ideas. Many how-to sites like Ehow and Do It Yourself Weddings are worth a try. Another option is to purchase an inexpensive trellis or arbor at a home improvement store or garden shop and decorate it for your ceremony to make your own chuppah. Finally, many couples purchase a chuppah or make their own, and after the wedding ceremony they are eager to sell it to another bride and groom. Therefore, you can look on popular resale sites for used chuppahs. Some options to try include Ebay.com and Craigslist. When it comes to what you will spend on a chuppah, it all depends on what you want. If money is very tight, you can build your own chuppah out of some poles and fabric for a price $200 or less. Or, you can buy an inexpensive trellis or archway at a discount store or garden shop and add some ribbon or fake flowers to it and probably still keep the wedding chuppah cost in the $200 price range. A second-hand chuppah will probably also cost around the $200, depending on how ornate it is and how much it originally cost. If you prefer to rent a formal wedding chuppah, you can expect to spend a bit more. Basic chuppahs can cost between $250 and $750 to rent. Keep in mind that if you decide to rent a formal chuppah frame from your florist and have it decorated with flowers, ribbon and other accents, this will cost considerably more. Most couples see a cost of about $1,200 to $2,500 for this. 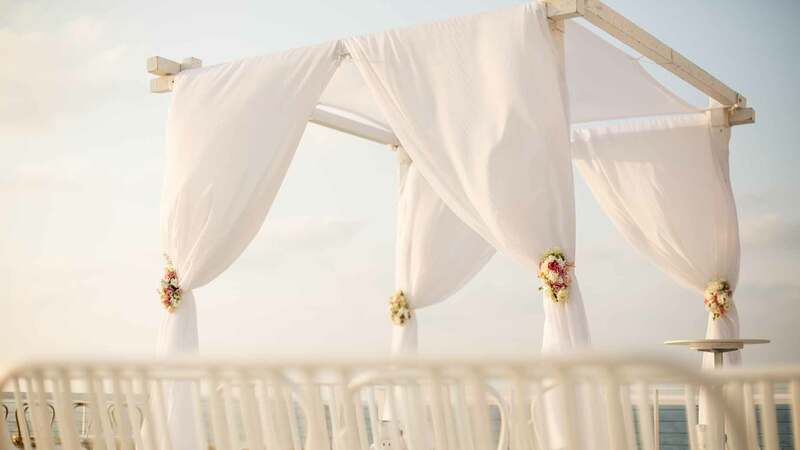 You may prefer to purchase an elegant wedding chuppah cover that you can use with simple poles. The price for a nice quality silk chuppah cover costs about $350 a to $1,500 for a custom chuppah cover or one that’s been hand painted, beaded or embroidered. You can expect to spend between $200 and $2,500+ to buy or rent a wedding chuppah, depending on what type you select and your decorating preferences. There’s a new trend in chuppah fabrics that’s also worth considering. Some ambitious couples today are involving their closest friends to them make a patchwork chuppah covering. If this concept appeals to you, you can ask some of your guests to provide their own decorated squares that you can incorporate into your covering. These pieces can be put together into a quilt that can be either attached to four poles or can be used to cover a frame or archway. This is a very special, and inexpensive, way to add a more intimate touch to your wedding and better yet, it will give you a family heirloom that you and your spouse will be able to cherish forever.